Other Immunogen Type corresponding to AGE. Glycated ribonuclease (RNase) prepared by incubating RNase with glucose at 37C for several months. Glycated ovalbumin, BSA and ribonuclease. Our Abpromise guarantee covers the use of ab176173 in the following tested applications. The non enzymatic reaction of reducing carbohydrates with lysine side chains and N terminal amino groups of macromolecules (amino acids, proteins, phospholipids and nucleic acids) is called the Maillard reaction or glycation. The latter products of this process, termed advanced glycation end products (AGEs), adversely affect the functional properties of proteins, lipids and DNA. In long lived tissue proteins, these chemical modifications accumulate with age and may contribute to the pathophysiology of ageing and long term complications of diabetes, atherosclerosis and renal failure. 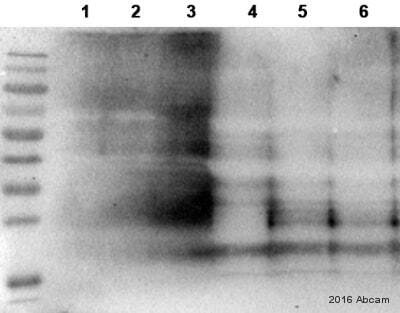 Western Blot analysis of proteins (500 ng) incubated either with glucose or not. Left panel corresponds to incubations with unpurified antibody 1) PI and 2) Test bleed. Right panel shows incubation with ab176173 at a 1/500 dilution. Publishing research using ab176173? Please let us know so that we can cite the reference in this datasheet. Methylglyoxal at 100mg/kg/j in drinking water for 8 weeks with or without metformin at 300mg/kg/j for 2 weeks.